PUT YOUR EMPTY SEATS TO WORK! GrabHitch is a social travelling platform that matches you with people who are going along the same route. As a driver, you can choose who to tompang on your ride, from destinations chosen by you so there is no additional hassle and everything is to your convenience! GrabHitch currently does not take any commission from drivers who use the platform, so you get to keep the whole fare that you see! Be part of the social travelling movement. Share your spare seats with people who are going in the same direction and earn an extra buck along the way! 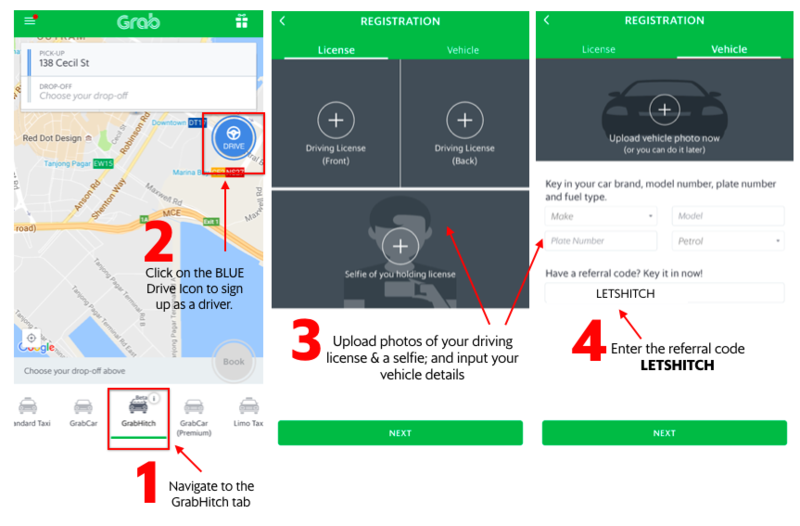 Anyone with a car and valid driving license can sign up to drive with GrabHitch – right from your mobile device! You are NOT driving for a commercial car hire service, you are essentially Hitch-hiking with someone who is going along the same way. Join the community today, signing up takes less than 5 minutes! There is absolutely no additional registration involved, nor any obligation to do rides on a regular basis – you choose who to pick up and when to do so. Signing up takes less than 5 minutes! 4. You MUST enter the referral code LETSHITCH to get your $30 credit after you have completed your first GrabHitch ride as a GrabHitch driver! This incentive is only eligible for new drivers who sign up and successfully complete 1 Hitch ride as a driver between 2nd December 2016 @ 00:00 hours – 31st March 2017 @ 12:00 hours. New drivers must sign up with the referral code LETSHITCH in order to qualify for the $30 credit incentive. The processing of the $30 credit incentive will only be conducted after the incentive period has ended (post-31st March 2017). Please allow up to 10 working days for the crediting of the $30 incentive into Hitch driver wallets. If you’re still not sure how to sign up, or have any questions regarding GrabHitch, email us at grabhitch@grab.com with the Subject: LETSHITCH and we will get back to you in 1-3 working days.